Perfectly intelligent programmers often struggle when forced to work with SQL. Why? 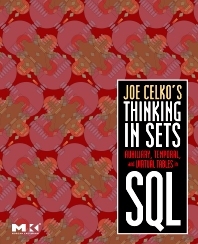 Joe Celko believes the problem lies with their procedural programming mindset, which keeps them from taking full advantage of the power of declarative languages. The result is overly complex and inefficient code, not to mention lost productivity. • Filled with the insights of one of the world’s leading SQL authorities - noted for his knowledge and his ability to teach what he knows. • Focuses on auxiliary tables (for computing functions and other values by joins), temporal tables (for temporal queries, historical data, and audit information), and virtual tables (for improved performance). • Presents clear guidance for selecting and correctly applying the right table technique. Data analysts and database developers from all backgrounds, regardless of which database technology they use; this is the market for all of Joe's other books, all our data modeling books in general as well. This includes database developers working on transactional (OLTP) systems as well as data warehouse design (OLAP systems). Unlike most of Joe's other books which are for very experienced SQL programmers who want to become gurus, this book has the widest possible audience of programmers new to SQL as well as those who are very experienced.